Comments: Martin W. & Maude Zindel (Nee: Day) | PA | | Comments: Wedding day photograph of Martin William Zindel and Maude Rufa Day. 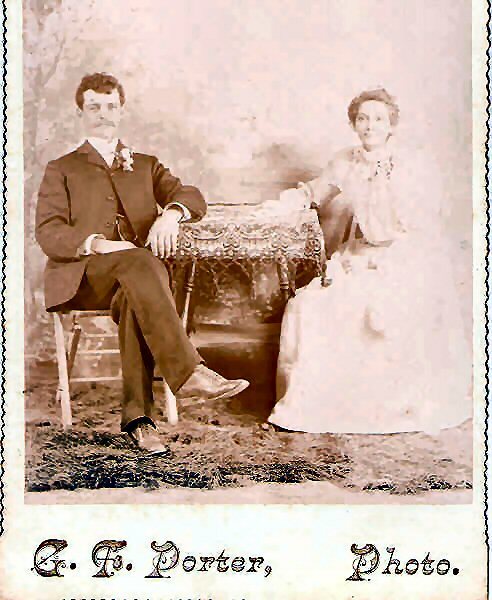 They were married on June 1, 1898 when he was 30 and she was 24. This photo album was submitted by Karen Zindel Sutton. Karen writes, This album is of the Zuendel/Zindel's of Erie and Forest Co, PA. The pictures must all be relatives or descendants of the original family of Johann Heinrich Zuendel b 1787 and Dorothea b 1799.